Oscar Pistorius will not be disciplined after criticising the International Paralympic Committee (IPC) over the rules on prosthetic running blades. The 25-year-old South African was second behind Alan Oliveira in the T44 200m final and was unhappy at the length of the Brazilian's blades. Pistorius later apologised for the timing of his remarks. IPC communications director Craig Spence said: "There will be no disciplinary action." 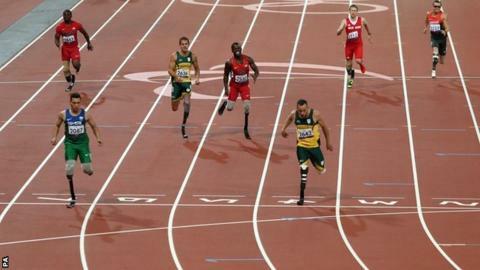 Pistorius is keen to meet the IPC to discuss the regulations but he will have to go through official channels. Spence added: "We're waiting for the national Paralympic committee of South Africa to go through the relevant channels and contact the IPC and then the meeting will be set up."